Garden Learning has been in hibernation for the last few months. For two reasons one a broken wrist made it hard to type and take pictures but more importantly in Minnesota the ground is white and frozen, the air is cold and nothing is growing. It doesn’t mean that things are not happening in the garden. My home garden is full us animal tracks. The rabbits and squirrels are seeking food daily leaping across the snow and frozen ground. This week as the weather continued the January thaw the squirrels were very playful in the high branches. 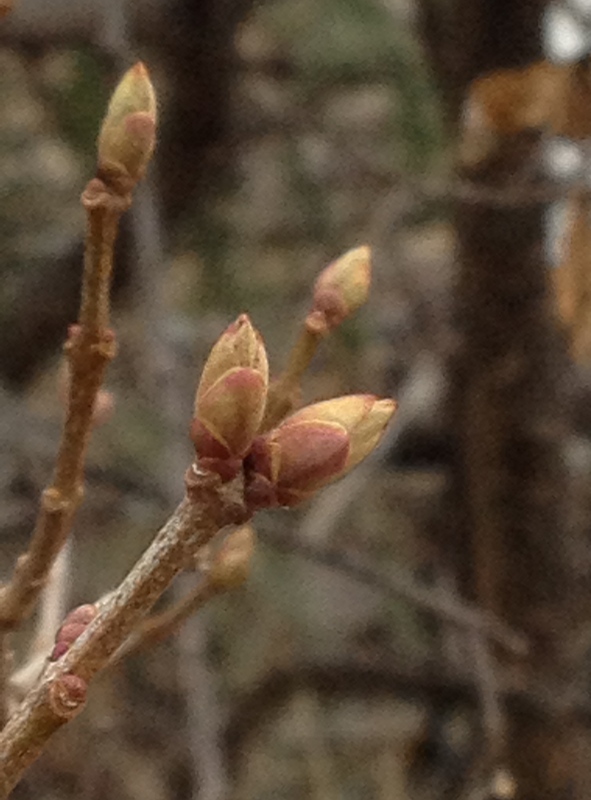 The trees from my window looked like brown dead sticks but when I went out to walk the edges of the yard it was surprising to see tight small buds just waiting to spring into growth once the weather stays warm. February also brings us closer to home gardening season and this year I am expanding the home garden to include new raised beds for vegetables along with my wild flowers, and not so wild flowers. Since Minnesota is so far north our growing season is short. If I want to grow vegetables and some types of flowers I will need to start them inside. Their growing season is just to long for those of us who live in the northern part of the United States. Growing inside in the winter means I will need a good light source, the sun is not high enough in the sky or shinning long enough each day to start young plants by a window. I will also need a heat source since young seedlings need a steady temperature to grow. There are lots of ways to do this but I have taken a easy way and ordered a grow light and 2 mats that will work as heating pads for my new plants. We excitedly waiting for these things to arrive in the mail. Once they and the seeds are here I will being my garden for 2015. I will keep you posted on this inside garden as we watch our outside wild garden slowly wake up. I have created a phenology chart to track the weather and when I see plants begin to grow. I am also recording what animals I see and the changes from winter to spring. Phenology is the study of seasonal natural phenomena or events. In other words – the watching of the world around us in relationship to climate, plants and animal life. Welcome to 2015 and Garden Learning! Are you planting a garden this year? What will you be growing and watching as the days get longer and the weather gets warmer? 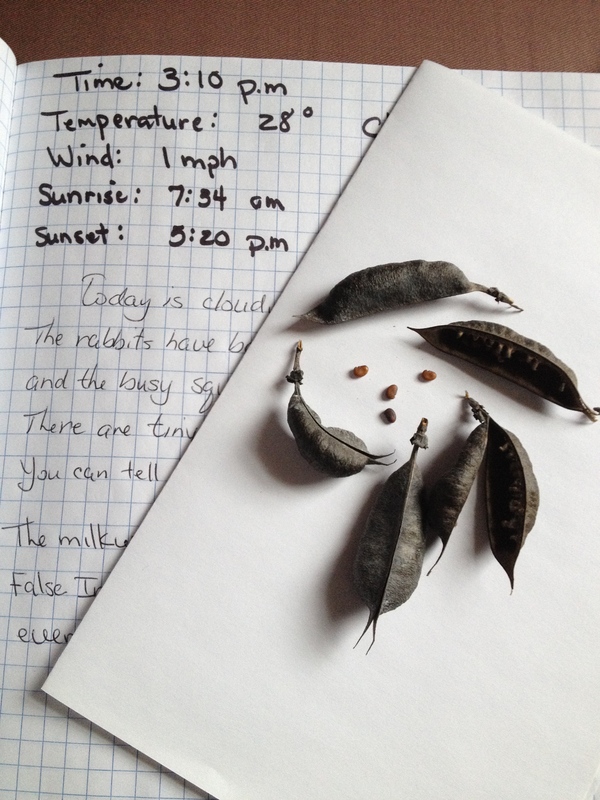 This entry was posted in Garden Learning, journals and tagged beginning seedling, garden journals, grow lights and heat mats, phenology journal. Bookmark the permalink. A gardening journal sounds like a lovely project! We have a short growing season too, but I have yet to perfect the art of starting plants indoors at just the right time. I’ve given up and get my vegetable starts from a nursery. 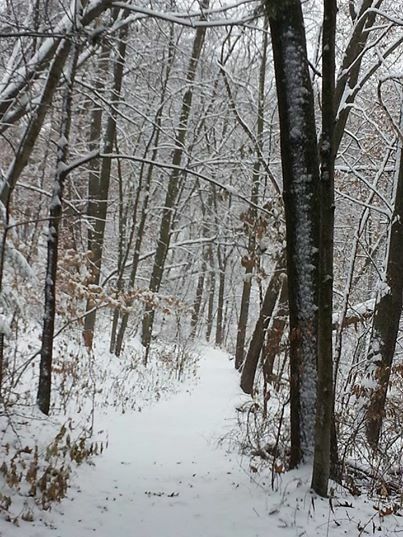 Your post today made me think of Kate Messner’s book “Over and Under the Snow”. It’s a beautiful picture book! Thanks for sharing your garden journal. I am inspired to begin one as well. I have a rather complex landscape design – not done by me, but I attempt to maintain and enhance it. This is such a good idea to keep careful track. Do you include photos or drawings? I love the idea of a gardening journal. I have a garden club and think we will revisit this idea. Thank you!!! And every year I grow Japanese Indigo. Love dying fiber with it. So fun to watch it all go from mucky greenish/brown to a brilliant blue! PS. Love Kate Messner’s books too. Have you seen Up in the Garden and Down the Dirt by her? Lovely.